Margaret Chase Smith (1897-1995) of Skowhegan, Maine, was the first woman elected to both houses of Congress. She replaced her late husband in the House of Representatives 1940-49, and was elected to the Senate in 1948, serving 1949-73. Smith was a liberal Northeastern Republican (or "Rockefeller Republican) and was defeated for reelection in 1972 by an even more liberal Democrat, who attacked her support for the Vietnam War. She was notably honest, independent and courageous. Her concern for national defense during the Cold War led to service on the House Naval Affairs Committee and later several subcommittees of the Senate Armed Services Committee. Smith led the fight for granting women regular status in the armed services during 1944-48. After passage by the Senate in 1947, a bill providing for regular status for women encountered opposition in the House of Representatives Armed Services Committee from several members who would agree only to reserve status for women. Through adroit political maneuvering, Smith forced the issue to the floor, thereby demonstrating that regular status had strong support in the House and ultimately insuring the passage of the Women's Armed Services Integration Act of 1948. Smith was a longtime supporter of the Equal Rights Amendment and the leading advocate for women's presence in the military. In her 1948 campaign, she released a statement that said she was "a champion for the women" but "no feminist" because "a woman's viewpoint should be...free of any emphasis on feminine interest." She was a nominal candidate for president in 1964. She did respectably well, considering her lack of organization, time, and money. As a speaker she was pleasant and smiling; reasoned in her answers and without invective, she campaigned on the issues. “ The American people are sick and tired of being afraid to speak their minds lest they be politically smeared as “Communists” or “Fascists” by their opponents. The American people are sick and tired of seeing innocent people smeared and guilty people whitewashed. But there have been enough proved cases, such as the Amerasia case, the Hiss case, the Coplon case, the Gold case, to cause the nationwide distrust and strong suspicion that there may be something to the unproved, sensational accusations. Yet to displace it with a Republican regime embracing a philosophy that lacks political integrity or intellectual honesty would prove equally disastrous to this nation. The nation sorely needs a Republican victory. But I don’t want to see the Republican Party ride to political victory on the Four Horsemen of Calumny—Fear, Ignorance, Bigotry, and Smear. I doubt if the Republican Party could—simply because I don’t believe the American people will uphold any political party that puts political exploitation above national interest. Surely we Republicans aren’t that desperate for victory. I don’t want to see the Republican Party win that way. While it might be a fleeting victory for the Republican Party, it would be a more lasting defeat for the American people. Surely it would ultimately be suicide for the Republican Party and the two-party system that has protected our American liberties from the dictatorship of a one party system. Schmidt, Patricia L. Margaret Chase Smith: Beyond Convention. (1996). 392 pp. Vallin, Marlene Boyd. 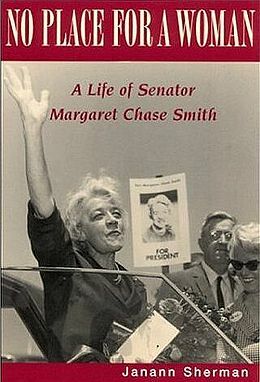 Margaret Chase Smith: model public servant‎ (1998) 243 pp. This page was last modified on 9 April 2019, at 12:09.